Subjects, styles, advertising, other relevant information: A single entry in the 1904 trade directory lists Stanley Frank Talbot as a photographer in Linton, but no trace can be found of him in the 1901 or 1911 census returns for that village. In fact in 1901 and in 1911 Stanley was living with his family at 91 High Street, Hastings, Sussex. In 1901 Stanley was living there with his father Frank Talbot b:1850 Twidale Staffordshire, a Secretary to a public company and his mother, Matilda, Nee Freshwater, b: 1855 Hackney. In 1911 Stanley was living with his mother Matilda, then described as being of independent means, and his younger sister, Irene, b:1888 Stoke Newington, a professor of music (which might have simply meant a private music tutor). In the 1901 census return Stanley was a scholar, in 1911 he was described as an "advertisement consultant". It does seem that the family were in Linton between the 1901 and 1911 census dates as Stanley's father, Frank, had died in Linton in Q3 1905, and Stanley's maternal grandmother, Matilda Freshwater, also died in Linton in Q21905. After 1911 it appears that Stanley married Winifred Grace Wilshin at Hastings on 24 September 1913 and when he joined the Royal Army Medical Corps in November 1917 he gave his address as 104 Petherton Road, Highbuty London N5 and his occupation as a printer. He suffered from a number of minor medical conditions and was classified as B2 fitness. He was made a Lance Corporal in the Royal Army Medical Corps and served at Crystal Palace. He was discharged from the army in February 1919. 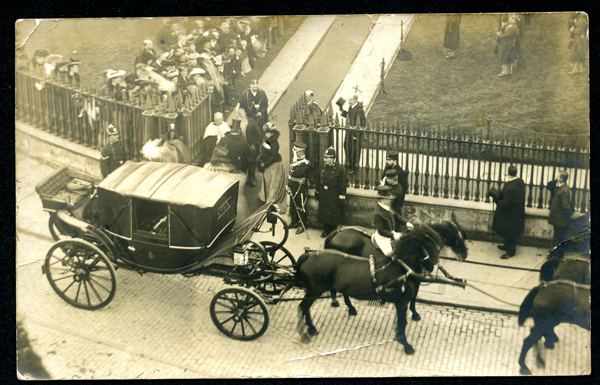 Stanley clearly was a skilled photographer as the postcard below of a Royal visit to the Senate House on 1st March 1904 demonstrates. 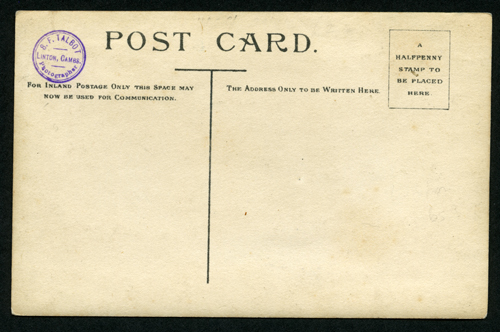 The card was postally used in April 1904. The photographer's stamp top left on reverse is a 15mm diameter rubber stamp "S.F.Talbot photographer Linton Cambs". Stanley produced postcards of views of villages around the Cambridgeshire, Hertfordshire, Essex borders, including Bartlow, Whittlesford and Linton. 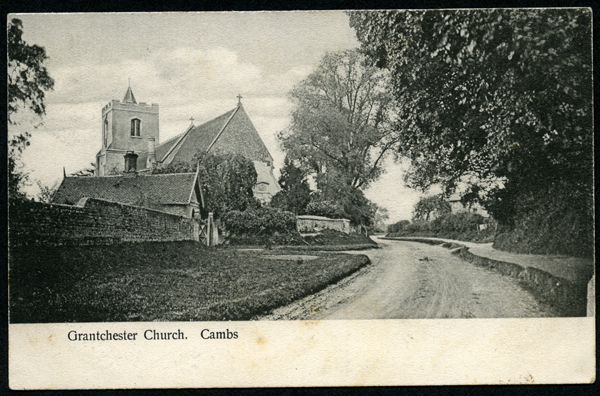 See below an example from the author's collection of a view of Grantchester Church, printed on matt card, postally used in 1927. On reverse is printed ""Country View" series No 451 S.F.Talbot, Linton Cambs". 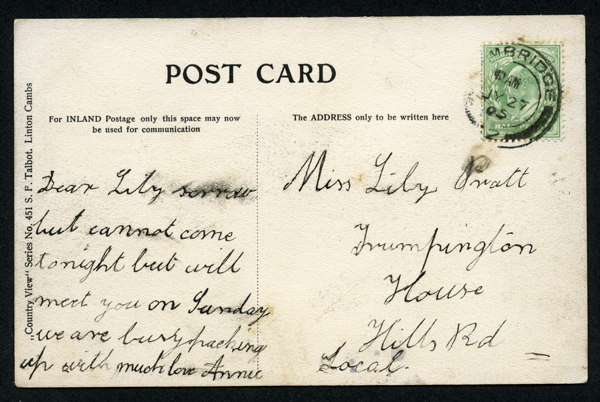 Beneath is another example postcard portraying what was thought to be an unknown house, presumably from a South Cambridge Village and of similar vintage to the 1904 example above. Stanley registered just one of his photographs at Stationers' Hall for copyright purposes. This was a photograph of the spot where the remains of Miss Holland were buried at Moat House Farm, Clavering, Essex, Copyright owner of work: Stanley Frank Talbot, Linton, Cambridgeshire. Copyright author of work: Stanley Frank Talbot, Linton, Cambrigeshire. Form completed: 2 May 1903. TNA COPY 1/461/45. Miss Holland was murdered by Samuel Herbert Dougal at Moat House Farm in 1903 http://murderpedia.org/male.D/d/dougal-samuel-herbert.htm and presumably Stanley sold this photograph to a newspaper. 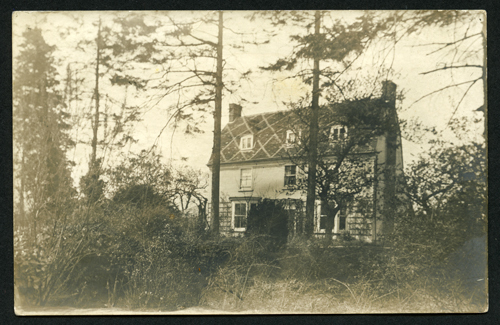 A second look at the postcard of an unknown house below shows that it is in fact a post card depicting Moat House Farm, the scene of this famous Essex murder from 1903 - a strange choice of subject for a postcard, but one which perhaps shows Stanley Talbot in a more entrepreneurial light than some of his contemporaries. Michael Rouse, The Villages of Old Cambridgeshire A portrait in Photographs and Old Picture Postcards, SB Publications 1989, page 42 has a post card by Talbot of the Post Office Linton. Subjects, styles, advertising, other relevant information: The brother of William Tams below. In the 1911 census he was shown as a compositor, living at 83 Alpha Road Chesterton with his wife and three children, the year before he was listed in the local trade directory as a photographer at the same address. Subjects, styles, advertising, other relevant information: Former Butler to Master of St Johns College, later a professional photographer. In 1891 William was living with his wife at 24 Albert St Cambridge and was shown as a college servant. By 1901 he was living with his wife and 3 children (Willie Horace Thomas, Frank Harry and Arthur) at 18 Priory Street Chesterton and was a butler. In 1911 he is shown at 19 Humberston Road Cambridge living with his sister in law and two of his children. He was listed as a photographer working on his own account from his home address. In the 1939 Register William was listed as a photographer at t19 Humberston Road, living with Aggie Tams b: 19/3/1869. 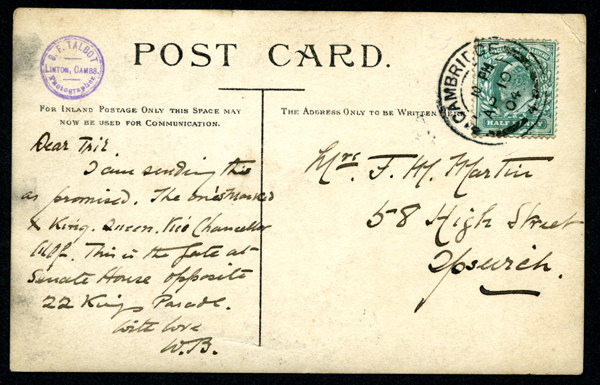 William published many postcard views of Cambridge and surrounding area. More than 100 of his Cambridge photographs are held in the Cambridgeshire Collection. In 1902 William was a member of a committee of local photographers organising the visit of a photographic convention of the UK to Cambridge. (Cambridge Independent Press 11/7/1902). 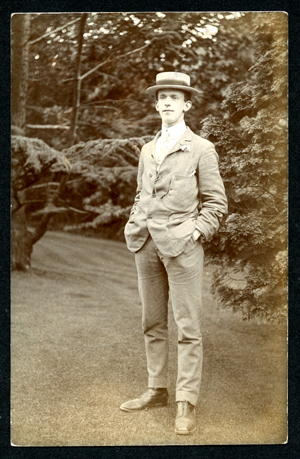 President of the Cambridge Photographic Club in 1916 and very involved in the management of the Club over many years. Became an official photographer of the University of Cambridge, but there are no examples of this side of his work in the Cambridgeshire Collection. See below a postcard format portrait of a young man in straw boater (author's collection). 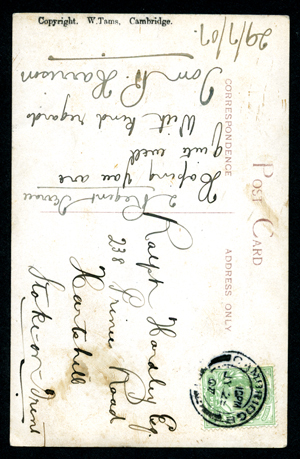 The postcard was postally used on 29th July 1907, postmarked Cambridge and has been signed "Tom R Harrison, 2 Regent Terrace", who may be the subject of the portrait. "Copyright W.Tams, Cambridge" is printed on the reverse. Michael Rouse, The Villages of Old Cambridgeshire A portrait in Photographs and Old Picture Postcards, SB Publications 1989, page 31 for a postcard of Turf digging in Burwell. Working Dates: The firm operated from the mid 1860s - 1890s in Cambridge? Subjects, styles, advertising, other relevant information: The studio claimed to be the largest photographers in the world. 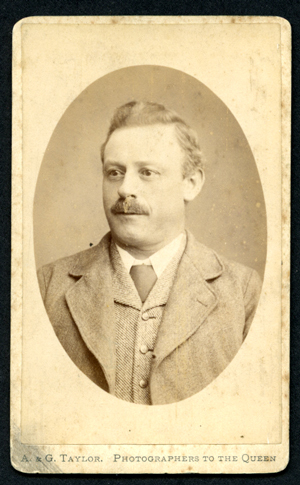 The oval carte de visite below of an unknown man was taken at the company's Sheffield Studio. The reverse of the carte lists all the firm's studios, and this includes Cambridge. 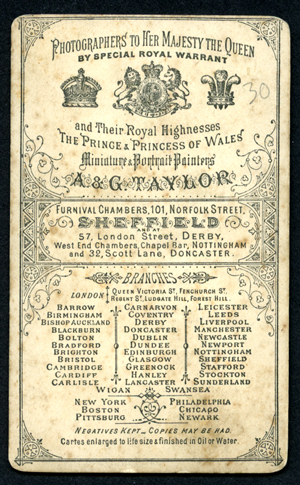 A wide variety of these lists of studios can be found on the reverse of the firm's cartes. References: Oliver Mathews "The Album of Carte-de-Visite and Cabinet Portrait Photographs 1854-1914" London 1974 lists A & G Taylor as having premises in Cambridge. However, no trace of their address has yet been found in local directories. Address: 1881 at Walpole Street Peterborough (parents home), 1891 at Fletton Avenue Peterborough, at least from 1901 onwards at Trinity Street, Peterborough, Throughout at The Infirmary Peterborough. Subjects, styles, advertising, other relevant information: Alfred Caleb Taylor was the son of an engine driver, John C Taylor b: 1840, Boston Lincs. in 1881 Alfred was living with his parents and siblings at Walpole Street Peterborough, his occupation was shown as a "dispenser". In 1883 Alfred married Emma b: Fletton Hunts 1864 and during their life together they had eight children. Alfred was in fact a dispenser at the Peterborough Infirmary, where he was to work for the rest of his working life. The Peterborough Infirmary opened in 1857 in a house in Priestgate Peterborough, provided for the purpose by Earl Fitzwilliam. The house is is now the Peterborough Museum, but there is still an old surgical operating room there bearing testimony to its earlier use. The infirmary operated there until the Peterborough Memorial Hospital opened in 1928. AC Taylor described his occupation in 1891 as a "medical dispenser". That same year he was slightly injured in a bizarre accident - dressed as Father Christmas for the children at the Infirmary he somehow set alight his cotton wool beard and moustache, burning his face - a story picked up by many newspapers in the UK and overseas. Some time before this he also became involved in the management of the Infirmary - it was in fact run by a charity. In 1889 Alfred was described first as the Collector of the Infirmary (Peterborough Advertiser Sat 16 March 1889), then in the same year as Secretary of the Infirmary (Peterborough Advertiser Sat 30 Nov 1889) - a post he was to hold until his retirement in 1926. It is not known exactly when Alfred became interested in photography. The Peterborough Advertiser on Saturday 26 January 1889 recorded that the meeting that week of the Peterborough Photographic Society had been chaired by Alfred, and later that year he presented a paper on "artistic photography" to the Society (Peterborough Advertiser - Saturday 18 May 1889). Already interested in photography and in medicine, Alfred followed the introduction of the medical use of X Rays, which had been discovered in 1895. He became an early and enthusiastic X Ray practitioner, building and using his own equipment at the Infirmary. In April 1898 it was reported that Brother AC Taylor gave a lecture and demonstration of X Rays to The Hope of The City Tent No 1151 of the Independent Order of Rechabites (a temperance based friendly society) (Peterborough Advertiser 9 April 1898) In another 1898 report on St. Marys Bazaar the Peterborough Advertiser reported that " Mr. A. C. Taylor, of the Peterborough Infirmary, gave X Ray lectures with practical illustrations, and around his sanctum were numbers of his photographs, of the highest artistic merit". (Peterborough Advertiser - Saturday 22 October 1898 p7). Photographs by Alfred were used to illustrate a number of books, including "Notes on Old Peterborough",by Andrew Percival (1905 Peterborough) and "The Depot For Prisoners Of War At Norman Cross Huntingdonshire 1796 to 1816" by Thomas James Walker 1913. In 1908 Alfred exhibited two of his photographs at Royal Photographic Society Annual Exhibition "Where clouds do nestle" (pictorial) and "Myositis Ossificianus" (in the section on Scientific and Technical Photography and its Application to Processes of Reproduction - so this was probably an X Ray photograph). But X Ray photography had many dangers and like a number of other early practitioners Alfred suffered greatly from injuries to his hands through over-exposure to radiation. When he retired in 1926 the Northampton Mercury reported: "X-RAY MARTYR. PRESENTATION TO PETERBOROUGH INFIRMARY SECRETARY. Mr. A. C. Taylor, secretary of Peterborough Infirmary since 1880, was an Wednesday presented with a cheque for £7OO and a silver tray, publicly subscribed, as a testimonial to his X-ray work, to which he has been a martyr, having lost several fingers on both hands as a result of his research work. In replying to the presentation, Mr. Taylor said if he had sacrificed six of his fingers he had been more than compensated, for he loved the work and its excitement. “If I could live life over again" he concluded, "I would do the same.” (Northampton Mercury 3 Sept1926. Alfred died in 1927. In 2015 a new accommodation block for medical staff at Peterborough was named "Alfred Caleb Taylor House, in his memory. References: Peterborough Book of Days by Brian Jones records July 26th 1927 as the day that Alfred Caleb Taylor died. In recounting his achievements he states "Taylor put together his own X Ray machine made his own batteries that gave him between twenty and thirty hours of power and, later, a six cell accumulator that needed two people to lift it. He took X Rays of injured feet hands and arms, and helped the infirmary surgeons work out how best to treat the many injured people they saw. His driving motivation was not investigating science for its own sake but helping others recover from serious injuries"
References: 1891, 1901, 1911 Census.